You know those ladybugs that appear suddenly in the fall, scrambling across the windows of your home like they're trying to get out, while you wonder how they even got in? Swarms of the critters descended on homes across Minnesota and Wisconsin the last few days as the temperatures warmed. These non-native bugs were introduced to the United States about a century ago to control pests. But they've become quite the pests themselves. "Yesterday I can honestly say I vacuumed up 100 of them in the house, all day long," said Lori Bissell of Knife River on Minnesota's North Shore. "I would just have the vacuum cleaner out, I'd see four or five, look away, there would be four or five more. I just don't know how they get in." Lynda Markon had a similarly annoying experience in Poplar, Wis., about 20 miles outside Duluth. She was getting ready for church when she noticed dozens of beetles covering the ceiling and walls of her living room. She says she's seen them before, but never so many. "You know I always used to think they were super cute little things, because I only saw a few of them," Markon said. "But not anymore, they're no longer cute." Multicolored Asian lady beetles, as they're known, are orange, not red, and a little bigger than the more familiar, native ladybug. They're also called Halloween lady beetles, because they often cluster around homes and other buildings in October, looking for warm shelter from the impending winter. They begin to fly to buildings seeking shelter when temperatures climb above 65 degrees, following days that dip to near freezing, according to the University of Minnesota Extension service. They first were spotted in the Upper Midwest in droves in the mid-1990s, said P.J. Liesch, who directs the Insect Diagnostic Lab at the University of Wisconsin. "Thousands of these insects would be trying to sneak in through gaps in siding, or around windows or door frames that don't quite seal properly," Liesch said. "And they can just be quite a general nuisance." They also bite. They can cause minor illness in people and pets. And they secrete a foul-smelling orange liquid when you disturb or squish them. The Asian lady beetle was imported to the United States initially in the early 1900s for biological control of pecan aphids in California. More were brought in the 1970s and 1980s. They've since spread around the country. In the Midwest they love to munch on soybean aphids, a nuisance to farmers in Minnesota and elsewhere. "If you were say a soybean farmer, you would love to have these out in your field," Liesch said. But not all farmers are fans. University of Minnesota entomologist Bob Koch says the beetles can cause significant damage to vineyards, where they like to feed on grapes that have been damaged by birds or wasps. "When the producers or growers go to harvest those grapes, and crush them, to make the juice for making the wine, they end up squishing the beetles, and the beetles have some nasty smelling compounds in them that can taint the resulting juice or wine." 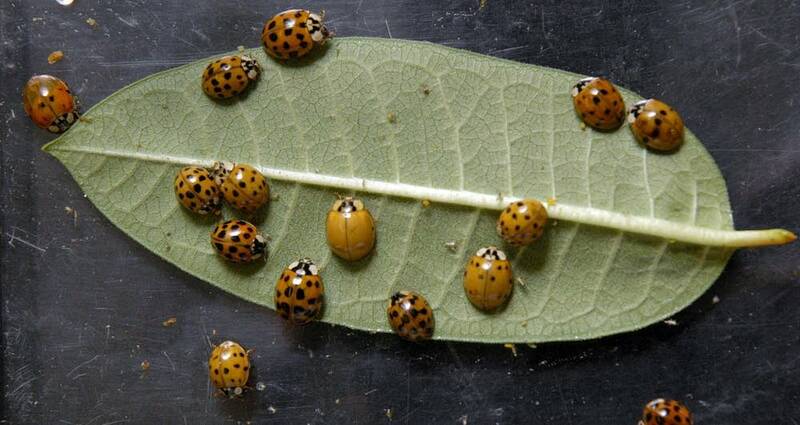 The invasive Asian lady beetles may also be harming native species of ladybugs. In Minnesota over the past 20 years, three species of ladybugs have become extremely rare, according to the Minnesota Department of Natural Resources. Koch says scientists from Europe to South America have documented declines in native ladybugs, at the same time invasives like the Asian lady beetle have proliferated. "This species is a real strong competitor," he said. "It can sometimes out-eat some of these native species, and in other cases it can actually eat some of the native species." Koch isn't sure why there seem to be so many Asian lady beetles this fall. He suspects an abundance of aphids or other prey. And, he warns, if you don't like these bugs, just wait for another invasive insect called the "brown marmorated stink bug." 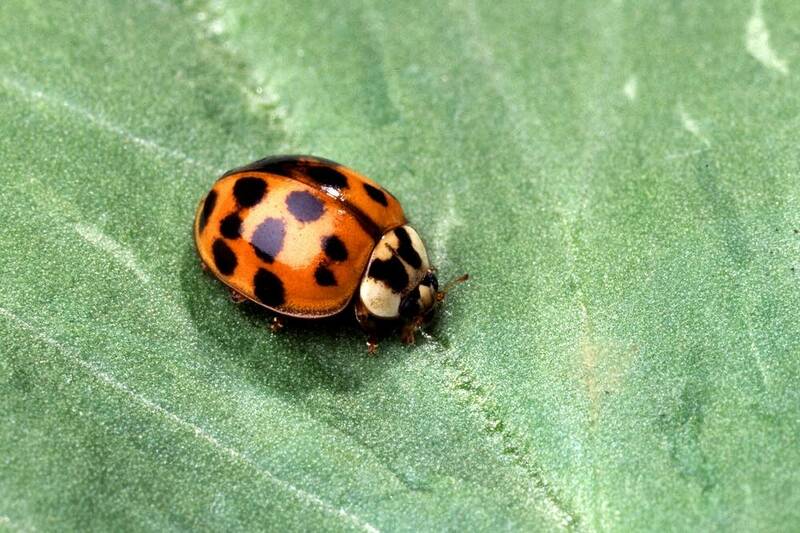 It also likes to take shelter in homes, but is bigger and stinkier than the lady beetle. As many as 20,000 have been found in a single home on the East Coast. And, he says, it's starting to show up in Minnesota. "I think they're at the beginning stages of their invasion process in Minnesota. But with time, they're likely to spread more likely within the state, and their populations are likely to increase," Koch added. "It will be just one more unwanted household visitor."